This article deals with the myth of queen Theodolinda, concentrating on the centuries between the Late Middle Ages and the Early Modern Era. During this period, the Lombard ruler – highly praised by pope Gregory the Great and Paul the Deacon – was regarded as an exemplary model of Christian virtues and political skills in a wide range of narrative texts. Making use of her exceptional qualities – so it was commonly believed –, she had managed to convert not only her husband(s), but also the fierce Lombard people. Far from being just a local or dynastic heroine, Theodolinda was thus portrayed as an ideal of feminine behaviour and, more generally, as a suitable moral guide in the face of the new religious and social challenges. Paris BNF lat. 8093 (VIII) and Paris BNF lat. 8318 (III) are the two parts of a complete witness of the Disticha Catonis, dating from the middle of the IXth century. Editors did not exploit it as a codicological unit. On palaeographical and textual grounds its origin can be located in the scriptorium of Hincmar of Reims and the text of the Disticha Catonis can be fitted in a stemma. The lost archetype of the Disticha had been brought by Theodulfus of Orléans from Northern Italy to Lyon in the early IXth century. The dissemination of the work started at Lyon and was resumed by the Reims scriptorium of Hincmar, in the mid IXth century. In his De anima IV 4, Avicenna supports that man can act outside of his body and transform the natural world by the power of his soul; these ideas apply to fascination and prophecy. This article studies the reception of this doctrine in the West and the learned practices which accompanied it. It focuses on the way the Latin authors of the XIIIth century summarized and rewrited this doctrine, before the critical debate itself. They provoked a distortion of the thought of Avicenna by transforming his argument with two types of modification: the deletion of the concerned passage and its transformation into a doctrine of the power of the imagination at a distance. These two modalities had important repercussions on the reception of the doctrine of the power of the soul on the long lasting. In this article, the Codex Paris, Bibliothèque National, grec 3, produced in 1095, is examined as a South-Italian witness of peculiar readings and glosses to the biblical text, referring both to the Latin Vulgate and to the Judeo-Greek tradition of biblical translations. Also a later stage of its history is described, when the manuscript was employed as a “study-tool” by Nicolaos of Otranto-Nectarios of Casole and his entourage: the scholia written (or – at least – worked out) by the Basilian monk and abbot are edited and commented; they offer further evidence to his acquaintance with the Jewish exegesis and possibly with the Hebrew language. The article aims to provide an updated status questionis about the milieu of the socalled Pisan-Genoese atelier, that produced a group of manuscripts copied by Pisan scribes incarcerated in Genoa prison, after the battle of Meloria (1284). 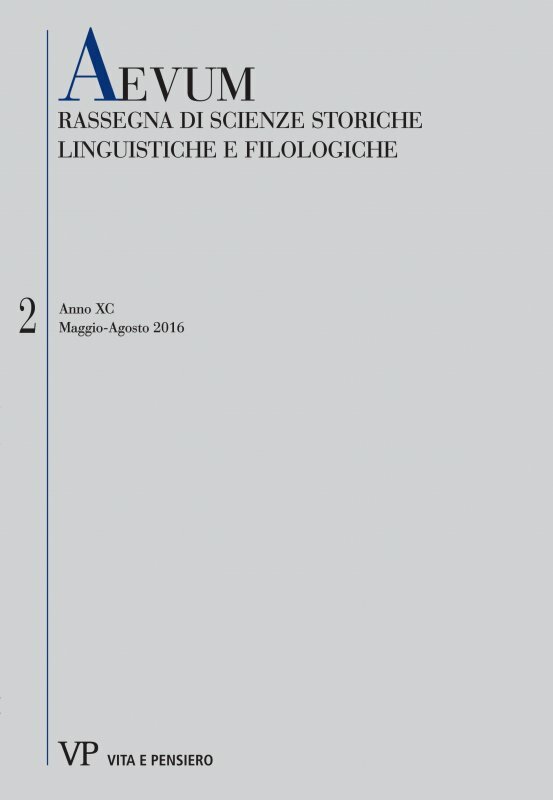 Starting from an analysis of the literary and archival sources, the article tries to define the historical background of Pisan-Genoese atelier. The diffusion of Petrarch’s Latin works, with special regard to the German countries in the XV century, follows definite lines as the manuscript tradition coming from there shows. In fact, during this period a substantial number of manuscripts was written and read in monasteries, where Petrarch was appreciated as Christian moral philosopher; an other consistent group was property of students who studied in Italian universities or in the universities of Erfurt, Leipzig and Vienna, and who read his works because of their interest on rhetoric and on the new culture. The publication of Agostino Sottili’s studies on Petrarch gives the possibility of reflecting on these matters and underlines that new perspectives on this research will come from the study of Petrarch’s reception in pre-humanists’ or humanists’ writings outside of Italy. The ms. London, British Library, Add 10081 includes, as preface to the six Terentian comedies, a curious text by Andrea Biglia (c. 1394-1435) in which the humanist makes the playwright speak for himself claiming a Roman ancestry and, therefore, denying his African provenance believed to be so since Antiquity. Biglia’s text is edited here for the first time in the two versions found in the London ms.: «Argumentum Terentii» and «Argumentum de origine Terentii». Particular consideration is given to its possible connexion with the controversy around the identity of Terence, which had arisen some decades earlier following the diffusion of Petrarch’s Vita Terrentii. This article proposes the study and the edition of the oldest statutes of the cathedral Chapter of Bologna (1453). The historical contextualization of the document shows that the development of a detailed set of constitutions was not only the result of a reorganization of old norms, but included a number of recent decisions necessitated partly in consequence of disputes, partly because of institutional changes. The coding developed by the canons will remain overall valid well beyond the borders of the fifteenth century, since the structure was fundamentally borrowed still in the modern era, as evidenced by the Constitutiones of 1582.